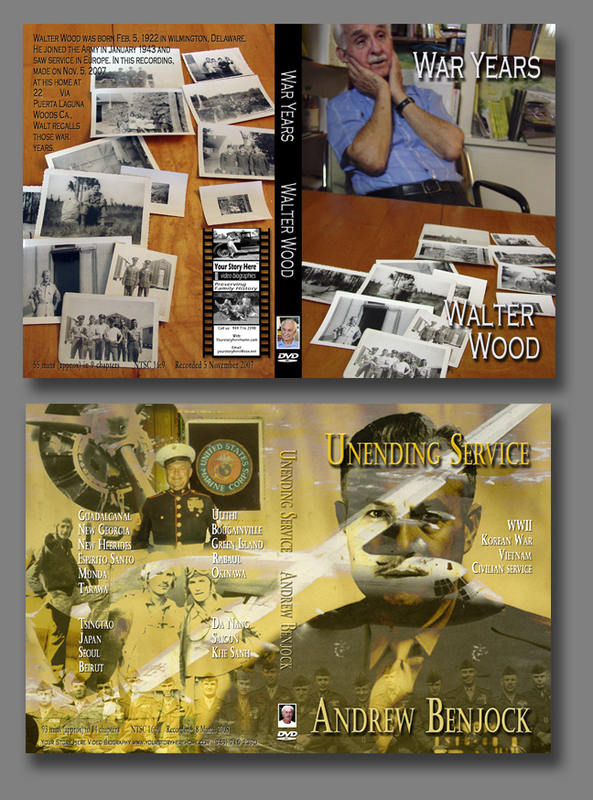 Our most popular product is our Deluxe Life Story Video Package which includes up to 50 minutes of fully edited video integrating interview footage with 100 restored photographs, documents, maps and historical images and footage. For this personal history documentary, we film an "occupational" introductory sequence capturing the subject's favorite activities and interests, or visiting places from their history - like their birthplace or first house. We also include other special features, such as bonus tracks of additional interview material. The Premium Life Story Video Package runs up to 40 minutes of fully edited video. You receive a full-on documentary of your loved-one's life. In the Premium Life Story Video, we combine personal interviews and up to 80 restored photographs, documents, maps and historical images and footage, to create a stunning "A&E" style personal history documentary. 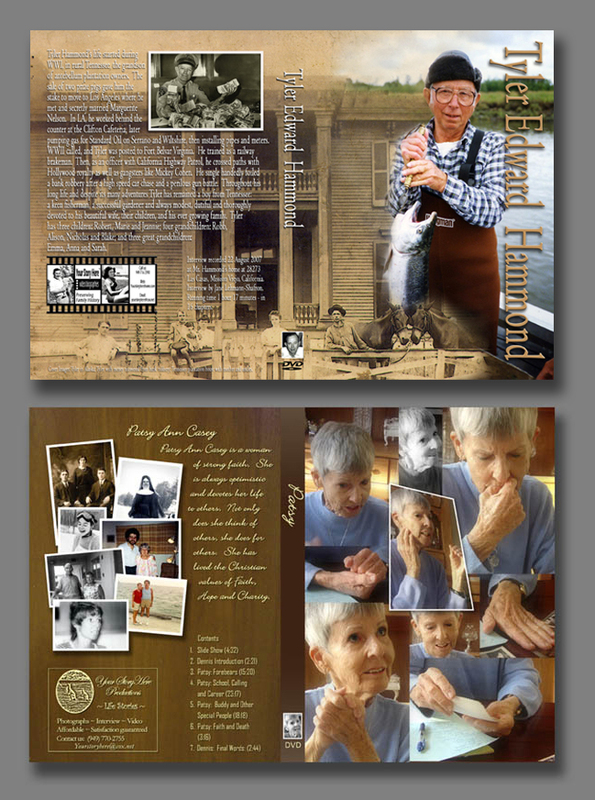 For both life story video packages, we custom design a DVD box and place chapters navigated from the custom DVD menu. We can also provide all of the raw, unedited footage - "the master tapes" - on hard drive. 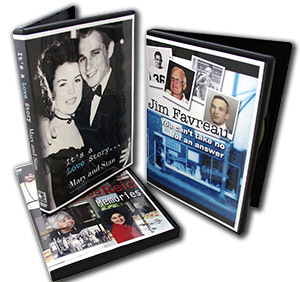 For each life story video product, legacy video and family memories video DVD, we create our trade mark custom DVD box and associated video graphics featuring images and information about the subject within a one-of-a-kind design. This helps ensure that the video is watched by all the family. Our work in this area often leaves our clients speechless! With Your Story Here you can choose from a range of personal and family history biography packages. >> Video Business & Career Tributes! Life story and legacy videos can be recorded to DVD or Blu-ray disk, or to a portable USB drive. Or, we can upload the video file or deliver it anywhere! And each legacy video and family history memories disk comes in a custom designed DVD box - with stunning art work specific to Your Story. Your Story Here video biography products can be formatted for web posting or even smart phone and tablet viewing. Of course, packages can be tailored, for example we are often asked to combine the life stories of couples. Whichever life story video, legacy video or family video memories DVD you choose, you can be sure that the highest standards of care and attention have gone into making Your Story an heirloom that will be treasured for many years to come. Life story video, legacy video and family history memories: Options to suit all clients.